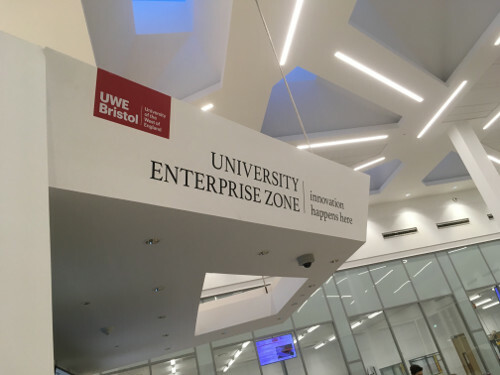 Members from the Bristol and West of England Initiative had the opportunity to take a tour of the University of West of England Enterprise Zone (UEZ) recently. The pioneering space provides laboratories, offices and workshops, shared start-up 'studio' space, communal space for networking and meeting, access to specialist equipment and technical support and business services. Hosted by Tracey John, Head of Research and Business Development at UWE, the tour demonstrated the role UEZ plays in developing the region’s economy and how businesses can benefit from its facilities. 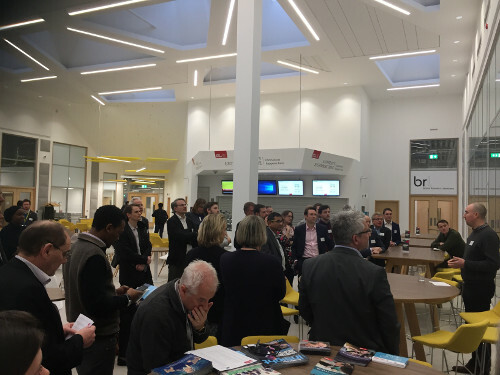 The tour began with Kim Brookes, Incubator Manager at UWE who showed businesses around UEZ’s impressive Launch Space and incubator space, and gave an overview of the enterprise support on offer to start-up businesses such as Bonnie Binary Ltd, Bunk and Seatox. While support is available to graduates from all UK universities, 75% of businesses within the Incubator have been formed by UWE undergraduates and graduates. “UEZ has developed over recent years to encompass 3 incubators providing start up business opportunities for UK graduates, hardware based initiatives and high tech high growth concepts, with grow on space available at Future Space offering flexible workspaces purpose-built for science & technology. With support services in health tech and robotics, UEZ has become a beacon in the West of England for growing future businesses and developing technologies.” said Kim. Mark Corderoy, Incubation Manager of the Bristol Robotics Lab then took the tour around the technology incubator. As part of fourth industrial revolution, robotics will drive our future economy and technology incubator creates a space for testing ideas, developing hardware and commercialisation. Our members got to see a number of projects in development from drones to paint ships, to an altitude sensitive alarm for skydivers and an educational dog shaped robot. Next on the tour was Future Space with IT Director, Martin Reid. Future Space incorporates offices, workshops and lab space for science and tech-based businesses, with its open layout explicitly designed to encourage innovation, collaboration and inspiration. Future Space offers bespoke support to science and tech companies such as Reach Robotics, Open Bionics, Esoteric Systems, and DesAcc EMEA to name a few. The tour continued in the Health Tech Hub with Professor Richard Luxton of the Faculty of Health and Applied Sciences at UWE. This facility is focused on advancing technology that enables people to live independently and manage their own health and well-being, thereby ensuring they spend the least possible time in hospital. The hub offers practical help for businesses to develop their products and test their prototypes with companies able to access: wet labs, dry labs and living laboratories, prototype design and testing, business & networking support. Current products in development include next generation diagnostic wearable bio-chemical sensors able to detect diseases and monitor patients long term health conditions, as well as highly sensitive, easy to use devices for rapid detraction of infections for home use. The Tour ended with short presentations from Chris Lyons, Innovation Manager at Business West and host Tracey John, who explained the support available to businesses to from finance, funding, technology commercialisation or new product and marketing strategies. Tracy then spoke to members about the local industrial strategy and the opportunities businesses had to engage with the university. Feeling inspired to think more innovatively? A new perspective and great insights can come from leadership and management training - who knows what your business is capable of?